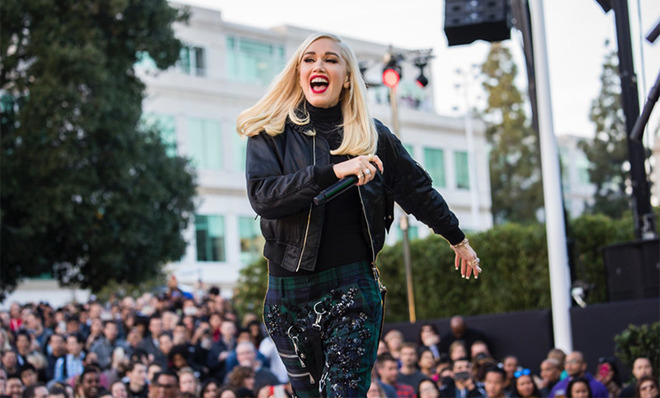 To ring in the holidays, Apple on Friday invited employees to attend a semi-annual Beer Bash at its Cupertino, Calif., campus, where singer Gwen Stefani showed up to perform a few cuts off her new holiday album. Following the event, Apple CEO Tim Cook posted a short message to Stefani on Twitter, thanking her for joining in the festivities. "A huge thanks @gwenstefani for celebrating the holidays with us and performing from your new holiday album. It was B-A-N-A-N-A-S!" Cook wrote, referencing Stefani's 2004 hit "Hollaback Girl." Stefani replied, thanking both Cook and Apple Music for making her Christmas "even better." She appended the missive with the hashtag #youmakeitfeellikechristmas. The pop star also published a short clip of her performance in which Cook can be seen bopping in the background. A number of Apple employees who were at the Beer Bash posted their own accounts of the concert, including photos of Stefani's performance, to social media outlets like Twitter and Instagram. Apple's Beer Bash, which is currently held at the quad at One Infinite Loop, is a unique employee perk. A semi-annual event, the company recently celebrated its 40th anniversary last year with a Beer Bash featuring Zane Lowe and the Beats 1 crew. In 2014, the company put on Beer Bash events to commemorate 30 years of Mac and to kick off WWDC 2014. While no announcement has been made, future Beer Bash gatherings will likely be hosted at Apple Park, perhaps on the campus' rolling green hills or inside its main "spaceship" building.